The discussion will take be in two parts. The first part on Thursday, November 2nd, and the second part on Thursday, November 9th. It will start at 6pm on both days and be held at John Hancock Barber Shop located at 117 E Gurley St, Prescott, AZ 86301. Please fill out the form below if you plan to attend. 6 PM – We will provide food, likely pizza. Let us know if you have food restrictions. Hospitality, in the form of a good meal or refreshments. Curiosity, when you watch the first documentary about the religiously unaffiliated in America. Acknowledgment, when you participate in the small group discussion where you will be heard and feel validated. Come and see how our discussions are transparent, safe, and thought-provoking. There are no expectations on the guest, only on the discussion leaders who are making sure the environment is safe, open, and loving while discussing a range of ideas. If this type of discussion sounds appealing to you, please join us. 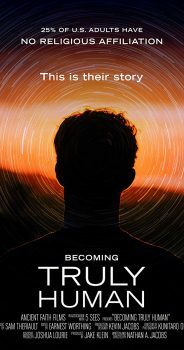 Becoming Truly Human is a thought-provoking documentary story for both the curious and the committed. Honest and humble. Transparent and transcendent.